Just the right amount of bling and fashion, that’s what this bag is all about. You will definitely take a second look without batting an eye. 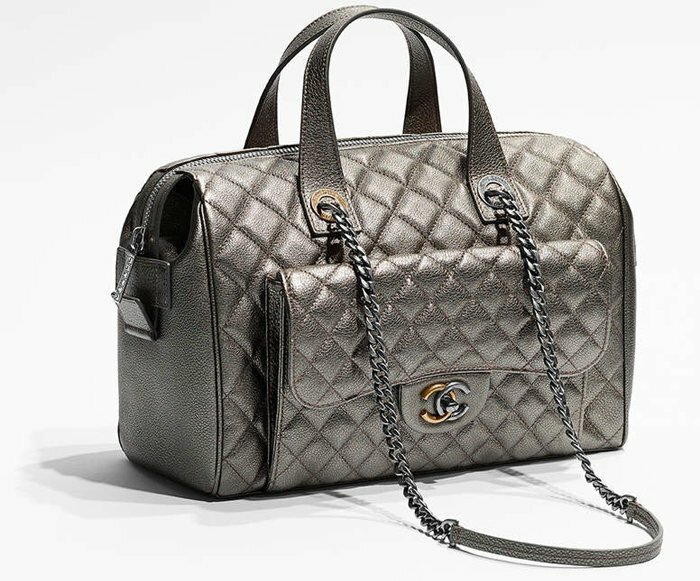 Ladies, welcome and take a closer look at this Chanel Quilted Bowling Bag with Front Pocket. Made from grained metallic calfskin, ruthenium metal & gold metal, this bowling bag from Chanel is the perfect bag to boot as you go on a date or have an afternoon long catching up with your girlfriends. And oh, this lovely bag comes in two different colors that you can choose from: black and silver. The bag with a bag, these kinds of style is so ‘in’ these days. Brands like Dior, Louis Vuitton and even Loewe has created their own version. Now let’s talk more about the bag details, shall we? This bag is pretty unique. Aside from the thick diamond quilting effect, we are loving the fact that it has a pocket in front. Talk about added storage! Its doubles handles are perfect for transitioning it from a handbag into a shoulder bag. Yes, we know how much you love having two styles in one bag. Lastly, we couldn’t put more emphasis on the fact that the CC logo is quite unique and stunning! And why is that? Come take another closer look. Did you see that? Yes, it features a bi-colored CC logo and that makes it an interesting bag, isn’t it? It sure looks like Chanel is dropping bombs all year-round and we couldn’t just blame them if women are going gaga over their uber stylish bags. Even if Coco Chanel is no longer around, her style spirit is still evident with these new creations. 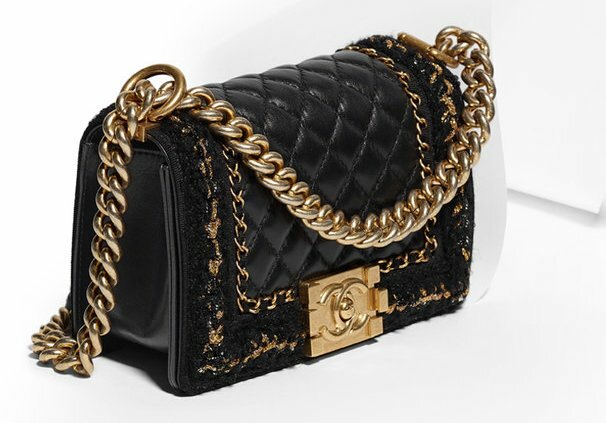 Ladies, brace yourselves for this Boy Chanel Quilted Knit Around Bag will make you want to own this, ASAP. 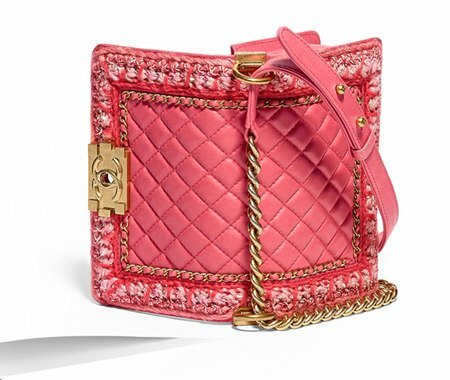 Cute and stylish with a feminine touch to it, this Boy Chanel Quilted Knit Around Bag is a sure fire way to glam up your look and everyday ensemble. Quirky, non-conventional yet still elegant, this bag is our latest favorite from this French brand. Let’s talk about the style of this bag. It has that thick diamond quilting effect we’re all accustomed to, but mind you, it has red interwoven chain links built around it. As if that is isn’t enough, the knit around the edges in playful pinkish tones and gold chain strap definitely and 100% made it to our top list for this year. 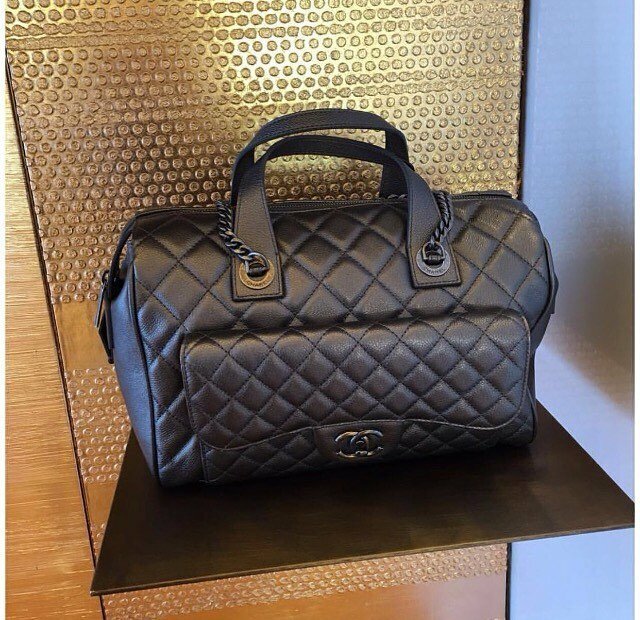 The Chanel Paris In Rome Quilted Bag is like a dream come true. Imagine you’re one of those Disney princesses and you’re fairy godmother is willing to grant you that one special wish. What would you ask for? If you ask us, definitely we’re going to wish for a Chanel Paris In Rome Quilted Bag. Elegant, sophisticated and polished, this wallet on chain (WOC) bag is our ultimate bag crush. And why not? A true style stunner, this Paris In Rome Quilted Bag is made from genuine sheepskin and is made lovelier with its light gold metal accents. The thick diamond quilting in the center and the new and beautiful CC logo on the lower part made it all the more stylish! 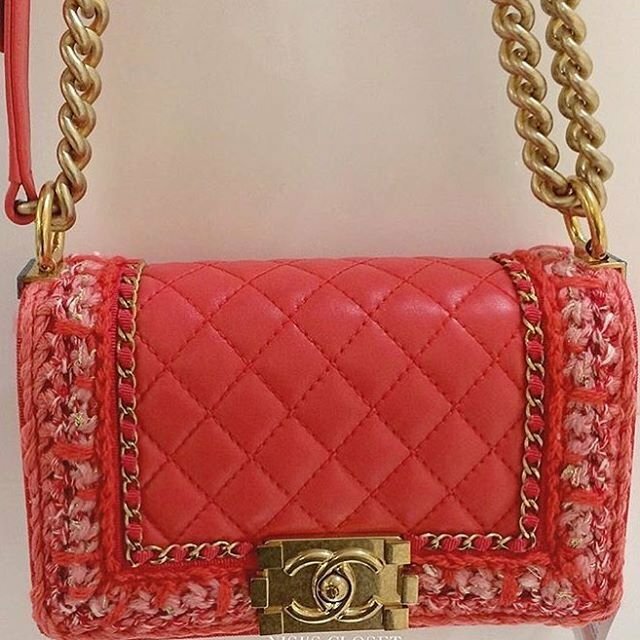 My oh my, as if those aren’t enough to make you sold on this bag, the interlocking chain straps on the other hand made us want to head to the nearest Chanel boutique store, pronto! As the popular Cinderella song goes “A dream is a wish your heart makes” upon seeing this Chanel beauty, we’d like to change up some words and come up with this “A pouch is a wish your heart makes.” So stop wishing and listen to your heart, we know it’s probably throbbing upon seeing the Chanel Small Quilted Pouch. Made from genuine lambskin & ruthenium metal and is sporting the color dark blue, this pouch is too lovely to pass upon! Trust us, you might want to bring it wherever you go as it can store some of your essentials in life such as your car keys, lipstick or mascara. What we absolutely adore about this pouch is the thick diamond quilting effect in dark blue color. It just looks too darling! The CC logo also adds more beauty to it. Style code: A69253, measuring 3.7’ x 5.9’ x 0.4’ inches, priced at $450 USD, €350 euro, £295 GBP, $560 SGD, $2900 HKD, $540 AUD and more colors available via Chanel boutiques.